This year's freshman class is one of the most diverse in the university’s history. 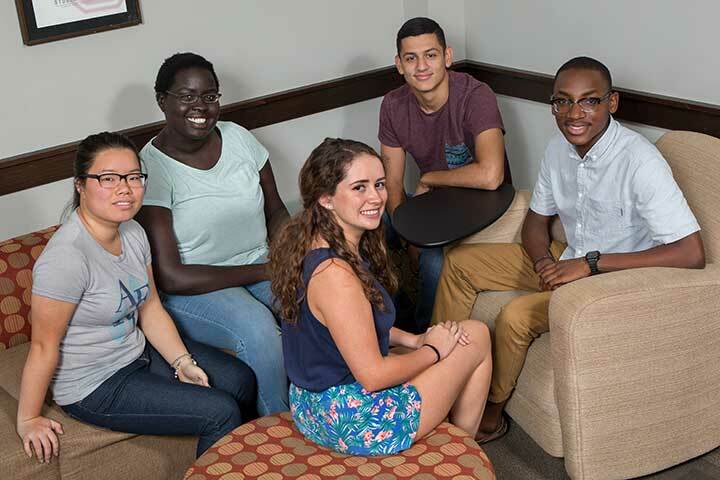 Left to right: Erin Christopher, 18 (Lexington, Ky./Creative Writing); Myryame Desrosiers, 18 (Miami/Biochemistry); Ancy Jose, 18 (Tamarac, Fla./Humanities & Creative Writing); Jaime Lopez, 18 (Miami/International Affairs & Economics); Unique Castro, 19 (Pompano, Fla./Exercise Physiology); Rose Leon, 18 (Tampa/Psychology). Florida State University will welcome about 42,000 students as classes begin for the 2016-2017 academic year Monday, Aug. 29. About 6,200 academically talented students make up one of the most diverse incoming freshman classes in the university’s history. An estimated 21.5 percent are Hispanic or Latino, 11.3 percent are African-American or African-American and another race, and 2.5 percent are Asian. The freshman class includes 410 students accepted through the Center for Academic Retention and Enhancement (CARE). The average high school grade point average was 4.1, with an average three-part SAT score of 1848 and an average ACT composite score of 28. This year’s incoming freshman class includes students from 63 Florida counties, 47 states, the District of Columbia and 28 nations. After Florida, the states with the most new accepted freshmen are Georgia, New York and New Jersey. The class also includes 49 international students. Women make up 59.4 percent of the new freshman class, while 40.6 percent students are male. The most popular declared majors are business, biological science and engineering. Twenty-five percent of incoming freshmen have either a family member who has graduated from or is currently attending Florida State. Twenty-nine percent are first-generation college students. 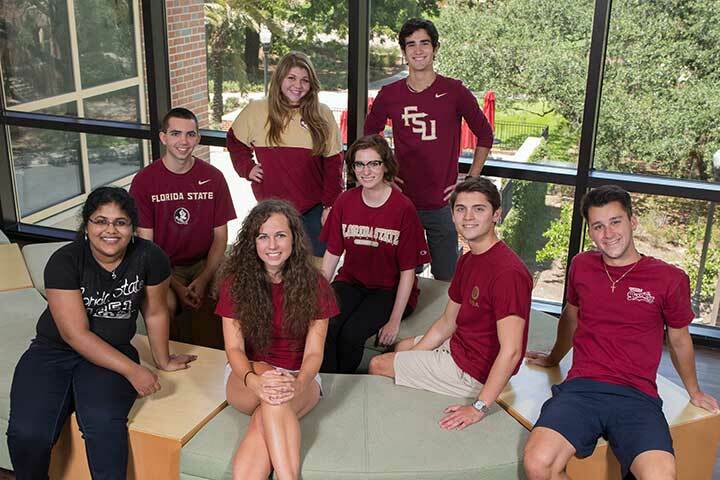 Hannah and Matthew are the most popular female and male names in Florida State’s Class of 2020. Members of the 2016 Presidential Scholars cohort. (Left to Right) First row: Ancy Jose, Erin Christopher, Joe Guidubaldi, Robert Cotter. Second row: Travis Burhart, Elianna Cooper. Third row: Cara Axelrod, Jaime Lopez. Twenty-six of this year’s most academically gifted freshmen are part of the university’s third class of Presidential Scholars. This merit-based scholarship program, established in 2014, is for freshmen who have been accepted into the university’s Honors Program. It provides a $4,800 annual scholarship for four years, and out-of-state tuition is waived for non-Floridians. Over their four years, the Presidential Scholars engage in programs to help them become transformational leaders in their communities. The freshman class also includes 410 students accepted through the Center for Academic Retention and Enhancement (CARE). The year-round program, which includes a seven-week Summer Bridge Program, provides traditionally underrepresented and first-generation students with enhanced academic support. This semester, the university will officially launch its new Undergraduate Interdisciplinary Medical Sciences (IMS) degree. Housed in the College of Medicine, the new IMS major will create a student-friendly pathway into the health professions. The College of Medicine is partnering with seven other colleges to provide two years of core sciences for every IMS student, who will then choose one of three majors: pre-professional (such as pre-med, pre-dental and pre-physical therapy); community health services; and medical data and analytics. More than 90 students are taking part in the new program this fall. 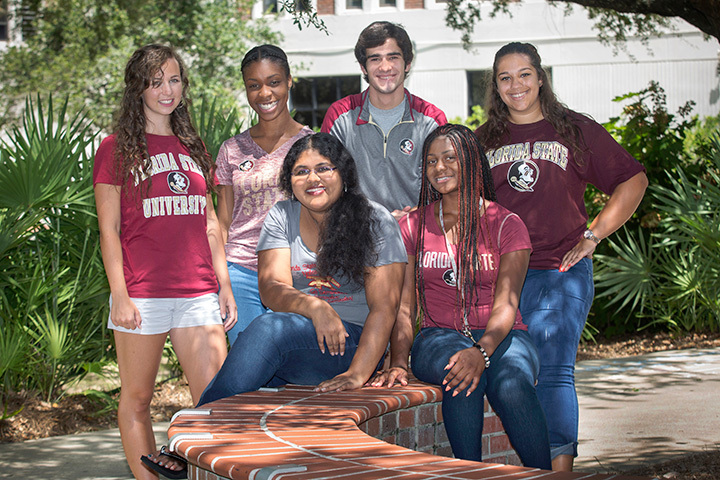 Florida State’s total enrollment includes nearly 8,000 students pursuing a graduate or professional degree. Selected incoming freshmen participated in the Service Leadership Seminar in the week leading up to the first day of class. Left to right: Jully Dong, Akice Agwa, Charlotte Puopolo, Norman Tabora and Caleb Dawkins.